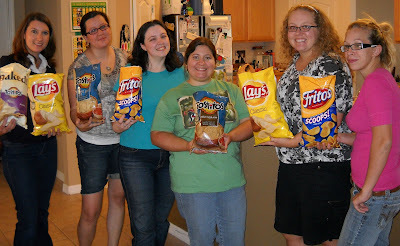 I was invited to a chip and dip party with some local bloggers. The only catch? I had to bring a dip. I thought seriously about buying one and transferring it to a container that would make it look homemade (You know you have done that before. Right? I can't possibly be the only person to do that!) but I decided that dip was a doable thing. After some "I'm scared to cook" tweets, Jessica sent me a recipe for a yummy looking dip. Which I'm sure really is very good....when prepared by someone other than me. One dip down. Thomas told me that he had a great dip recipe that he used to make all the time, so I went to the store and got the ingredients. I'm just glad that I didn't give us all some sort of food poisoning with that one. It was not good. Two dips down. I got some French Onion powerdy dip mix and added it to sour cream. Third dip....edible, maybe even slightly good. I grabbed my chips and headed to the party. Once I finally arrived (the drive to Lee's house is a story in itself that will have to be told another day) the party was very fun. And thankfully, my lack of gourmet dip was not that big of a deal, because all the other women brought such fabulous stuff. You wish you were eating some chips and dip right now, don't you? 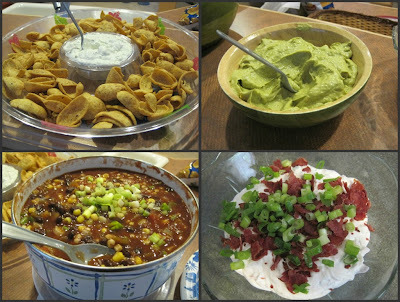 It is hard to pick a favorite (they were all so yummy), but Lee's Avocado and Salsa dip was pretty amazing, and I'm still eating leftovers from a container of Angie's Sweet Bean Scoops that I brought home with me. Now if only I could talk them into making me dip every week, it would be perfect. Let's recap what we learned today: Chips are good. Dip is also good. If you are planning a party, I recommend chips and dip. If you are looking for a recipe, I recommend that you stay far away from my kitchen, and ask one of those other bloggers, or check out these recipes from Frito Lay. And remember, the nice thing about chips is that they are good even without dip. What is your favorite way to eat chips? **Legal stuff: The Motherhood and Frito Lay provided me with chips and ingredients to make dip, and compensated me for my time. The opinions, and lack of cooking skills are all mine. Oh dear, Miss Tracie! You and I must never occupy a kitchen together. Me setting my best friend's oven on fire, you and your skillz... LOL!!! My mouth is watering (not kidding) and now I'm going to get my coffee and pretend like it's AVOCADOS! I cannot even READ the word avocado without going into some kind of crazy craving state that doesn't go away until I actually GET an avocado. =P Great post and those recipes look good! I cannot wait to read your separate blog entry about the trip to Lee's house. I was telling my husband about your ordeal and he was cracking up! THAT was the highlight of the party! Man I wish there were more bloggers in my area that I could do cool stuff like that with.. dagnabbit. I can make dips hun you just bring the chips you thomas and baby girl. good post. Almost have me thinking I could make a dip. Maybe I should contact Frito-Lay. I like Tostitos the best but I will not pass over any chips. I cannot believe the story you went through to get to Lee's on Tuesday!! lol. Glad you made it and we finally met. Hopefully if you're going to NKOTBSB tomorrow you don't get another ticket! What fun. And your dip was so easy to make. They'd probably prefer store bought from me. Looks like a Frito Lay ad! I"m so glad you liked my dip! 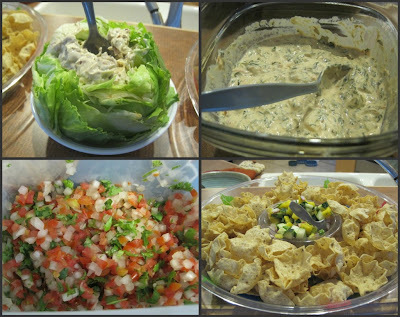 My own dip and that sweet bean dip of Angie's was my favorite as well. Holy Yum! Too many delicious looking dips. Must have some NOW. :) Gad - do I LOVE a chip and dip party.